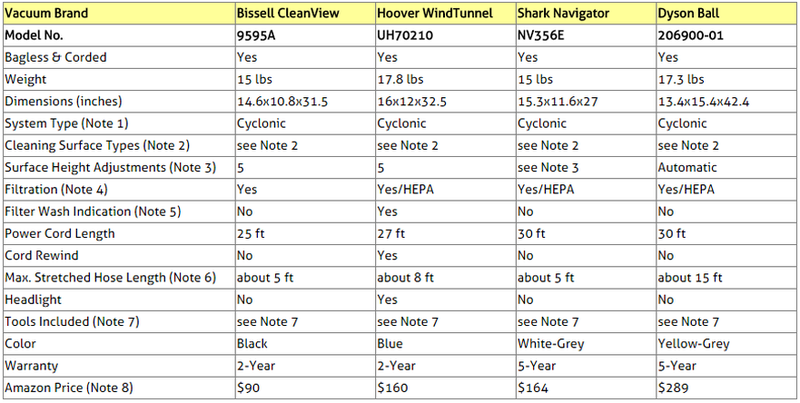 ​Compare Upright Bagless Vacuum Cleaners: Bissell CleanView, Hoover WindTunnel ​, Shark Navigator or Dyson Ball Multi-Floor? If you are planning to get a new upright vacuum cleaner, you have the option of getting either a corded or cordless unit. Even though nowadays cordless vacuum cleaners are equipped with powerful and long lasting batteries, some still prefer the corded types as they provide more power and there is no need to worry about battery charging. Not only were these the most popular upright bagless vacuum cleaners among Amazon customers at the time this article was written, but they had also received excellent reviews from most Amazon buyers (average ratings of 4.5 and 4.0 stars out of 5 stars!). Selected Upright Bagless and Corded Vacuum Cleaners on Amazon. Otherwise continue below with the comparison of the selected corded upright vacuum cleaners. Cyclonic technology uses the effect of high rotation to separate fine dirt from the air, to prevent dirt from clogging the filters, and to keep long lasting powerful suction. All four vacuum cleaners can be used to clean both carpeted and bare floors. They are equipped with different mechanisms for adapting the cleaner head to different carpet heights and bare floors (please see Note 3 below for further details). Note that all four vacuums come also with various attachments for cleaning upholstery and above floor surfaces (please see Note 7 for further details). ​Bissell has a dial that can be adjusted for 5 different surface heights from bare floor to high carpet. Hoover has a dial that can be adjusted for 5 different carpet heights. It also has a suction only mode that can be selected by pressing the brush roll shut-off pedal which allows easy transition from carpet to hard floors. Shark doesn't have the same kind of height adjustment dial, but you can choose to have the roller brush powered (for high carpets) or off (for low carpets). In addition, there is a bare-floor attachment that works great on hardwood and laminate floors. Dyson adapts automatically to different floor types. It goes from high pile carpet to low plush to bare floors without adjusting any dials or settings. You can see and hear the vacuum adjusting itself. All four vacuum cleaners provide HEPA filtration which captures and holds over 99.9% of dust and allergens. There are all washable and reusable filters. Only Hoover WindTunnel is equipped with an indicator that tell you when you need to wash the filter. The other three machines provide general recommendations in their manuals with respect to filter washing frequency requirements. Note that the hose length itself does not determine how high or how far you can reach for cleaning when using the attachments. One needs to consider also the extension wands that come with these vacuum cleaners as they attach to the hose to extend the reach. Note that Shark Navigator and Dyson Ball have the longest extension wands, and because they already come attached to the hose, they can instantly be released for use to clean stairs, up-high or hard to reach places. Bissell: Crevice Tool, Turbo Brush, Dusting Brush and 11-inch Extension Wand. These attachments can easily be connected to the built-in hose for cleaning above floor surfaces. Hoover: Crevice Tool, Powered Hand Tool, Dusting & Upholstery Tool and 12-inch Extension Wand. These attachments can easily be connected to the built-in hose for cleaning above floor surfaces. Shark: Crevice Tool, Dusting Brush, Pet Hair Power Brush, Dust Away Hard Floor Attachment, and 1 Microfiber Pad. Dyson: Combination Tool (upholstery tool, crevice tool, etc.) and Stair Tool. So which of the four vacuum cleaners should you get? If you are looking for an inexpensive upright bagless machine that will clean well your place, don't look further than the Bissell CleanView. Though it lacks some of the more sophisticated features found on the other three vacuum cleaners (such as HEPA filters), it is probably the best among the inexpensive machines you will find today on the market. In particular, the airflow it provides at that price is quite impressive. Shark Navigator Lift Away is the only one of the four that does not require to drag along the whole machine when you want to use the attachments to clean your home. The dust canister (together with the built-in motor, attached hose and extension wand) detaches from the main body and becomes portable, so you can easily clean anywhere without having to drag the main body of the machine (see Picture 2 above). This simplifies quite a bit the job of cleaning upholstery, furniture, walls, ceilings and other hard to reach places. Note also that Shark Navigator and Dyson Ball have the longest extension wands, and because they already come attached to the hose, they can instantly be released for use to clean stairs, up-high and hard to reach places. Please click the vacuum cleaner of your choice below for price information or to purchase.